The Monterey Peninsula Water Management District (MPWMD) has been rescuing young Carmel River steelhead (Oncorhychus mykiss) from the drying lower Carmel River as part of an annual program to preserve local stocks of the threatened fish since 1989. Every spring or summer, beginning at the Highway 1 Bridge, District staff follow the retreating river upstream and remove fish from pools before they dry up. 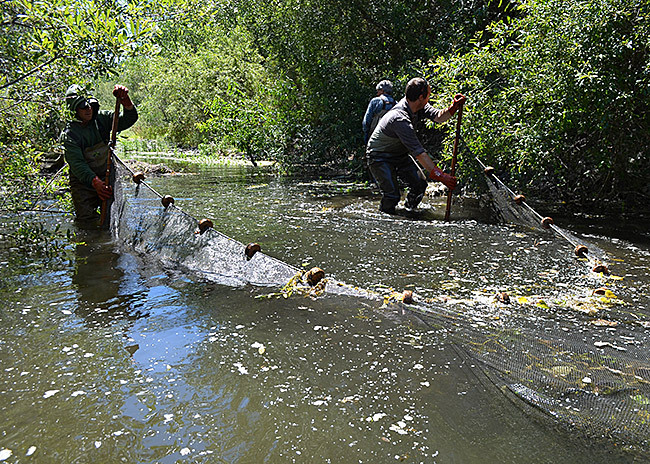 The rescued fish are either transported to upstream portions of the Carmel River with proper habitat conditions or to the District's Sleepy Hollow Steelhead Rearing Facility (SHSRF) if river habitat is not available. Fish are reared there until the river flows again in late fall or winter. The District's mitigation efforts on behalf of the fish, began as part of the 1988 Interim Relief Plan (IRP) to offset the negative impacts of water extraction by California American Water and other pumpers on the Carmel River. Since then, the District's legal responsibility to continue a mitigation program was solidified under the 1990 Water Allocation Environmental Impact Report to comply with CEQA, State Water Resources Control Board Order 95-10, and Water Rights permits for aquifer storage and recovery. 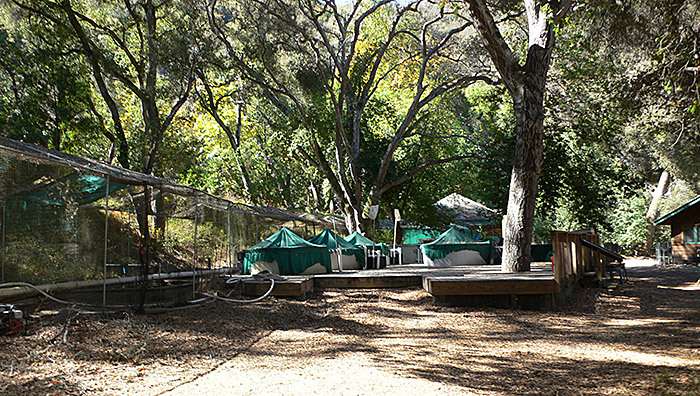 In 1996, MPWMD constructed the SHSRF in Carmel Valley. This facility features a simulated stream with riffles and pools, designed to provide a wild environment for the fish. It is important to note that this program rears wild fish for re-release to the sites where they were rescued, or as close by as possible, so that they don't compete with other wild fish. It is not a hatchery- it is a naturalized rearing facility. MPWMD most commonly rescues from 3/4 - 3 inch fish. So a lot of the fish are 1/2 to 1/3 the size shown. Less than 5% are usually 2-year-old-plus fish that can be much larger; 5 - 8 inches. Overseeing the fish rescue and rearing program is MPWMD Senior Fisheries Biologist Kevan Urquart who explains the benefits of the program in this way: "Studies on Chinook Salmon show that fish reared in this manner may have a better survival rate to their return as adults than do hatchery fish. We keep them as wild as possible so that they are successful back in their natural environment, while at the same time, not altering the genetics of the wild population." The annual fish rescues occur in late spring or summer depending on river conditions. The river usually dries each summer and into fall because of the combination of reduced rainfall and river inflow in the dry season, hot summer temperatures, and greater community water use. In 2012, MPWMD staff began fish rescues on June 15 because Carmel River streamflow conditions for fish migration in the lower river were inadequate. District crews started at the Highway 1 Bridge collecting the fish and transporting them to the SHSRF. Upon arrival at the facility, all the fish go through a quarantine process and are treated for disease and parasites, after which they are then sorted into three or more size classes, before release to the rearing channel where they are fed and monitored for release. Steelhead are the most cannibalistic of the salmonids, and need to be segregated by size as much as possible. Staff feed them primarily Bio-Oregon fish feed and frozen krill. They also have electric bug zapper lamps hanging over the rearing channel to drop insects in and some insects fall out of the overhanging forest, just like in a natural stream. After about two months, natural aquatic insect fauna builds up in the rearing channel and eventually the channel has the second or third best benthic aquatic invertebrate diversity and abundance of any site District staff samples in the actual river. Water quality in the rearing channel is often better than in the river, and the water leaves the facility cleaner than when it came in, as the facility is designed to be self-filtering. In December, 2012 District staff released the rescued and reared steelhead from SHSRF, between Valley Greens Bridge and the Highway 1 Bridge. During the rescue season of 2012 staff stocked a total of 7,417 fish into the rearing channel; 6,958 young-of-year and 459 yearlings. Staff successfully released 5,341 fish into the lower Carmel River; 4,968 young-of-year and 373 yearlings. Overall survival rate of fish reared at the SHSRF was 72%. Running the SHSRF to rear rescued fish for five to nine months each year is a more expensive part of the program than the actual fish rescues themselves. The facility has to be staffed and maintained 7 days per week by someone with biology/aquaculture training, and uses ~$2,500 month in power to run its pumps and cooling tower. 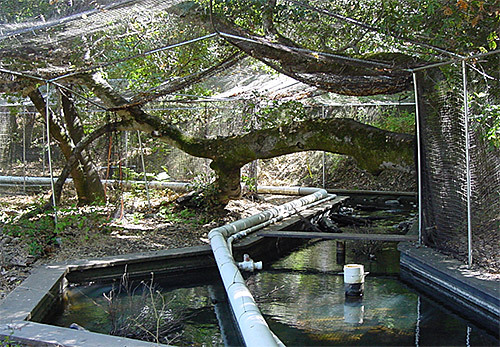 The SHSRF allows the District to avoid taking rescued fish upstream and releasing them on top of other local native fish, into habitat that may not have the capacity to rear the rescued fish, and where they may compete for space and food with the local fish, resulting in less than expected survival of both local and rescued fish. Will the State protect the Carmel River?